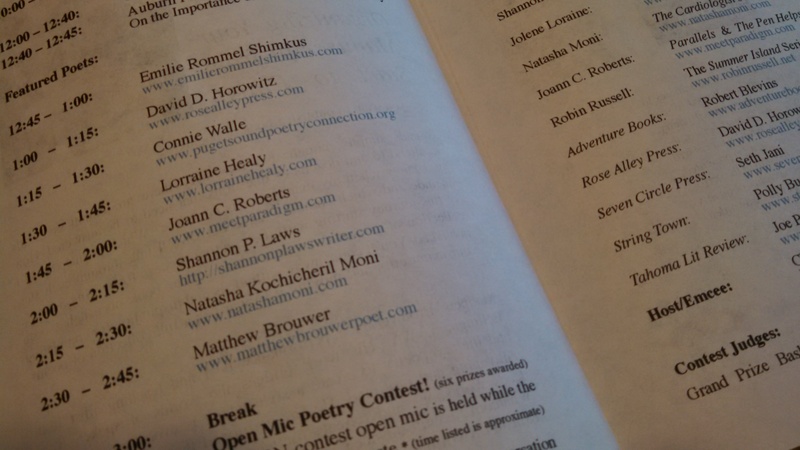 Earlier this month I was invited to share some poetry at a poetry event in King County. The event last all day and on the drive home I was plagued by an overwhelming sense of disappointment. I tossed the emotion around, examined it frontwards and back trying to figure out where and why I was feeling this way. Then I remembered that last fall I had a similar experience. Comparing mental notes about the two events my brain tried to find a connection. Reflection for me is not only helpful for growth, but it also assists in perfecting my poetry performance. Poets and writers perform to connect with the literary groups around them, but also, frankly, to sell books. Performance is something to seriously consider when you read to groups. You want the audience to understand your message, to hear it, and to feel it. Some of the similarities between the two “disappointing” events are: I did not share about upcoming events I was planning, and failed to inform the audience where to purchase my books. Also, I shared a short set of poems, safe poems, and quickly sat down, with little engagement. Then the root of the matter exposed itself. It wiggled its way through the mire. Took me all weekend but I finally uncovered the core of why I was disappointed. On both occasions, days prior, while preparing my set, reading the list of other speakers on the agenda, my inner critic spoke, “No one really wants to hear you speak. They came for the poet laureates and other big names. Why don’t you be polite and read a short, simple set and let the others have the spotlight?” I’m here to tell you today, if this voice shows up in your head—ignore it! DO NOT LISTEN! If you have been invited to an event to speak, then SPEAK! Share your heart and soul my writer friend. Do not hold back. Share your best work to date.